PHILADELPHIA, PA – May 23, 2018 – Janney Montgomery Scott LLC (“Janney”), a leading full-service wealth management, financial services, and investment banking firm headquartered in Philadelphia, PA, announced that The Connors Team, comprised of Leo M. Connors, Vice President/Wealth Management, and Leo M. Connors, Jr., Vice President/Wealth Management, have joined the firm’s New Haven, CT branch office. The Connors Team was previously affiliated with Merrill Lynch. 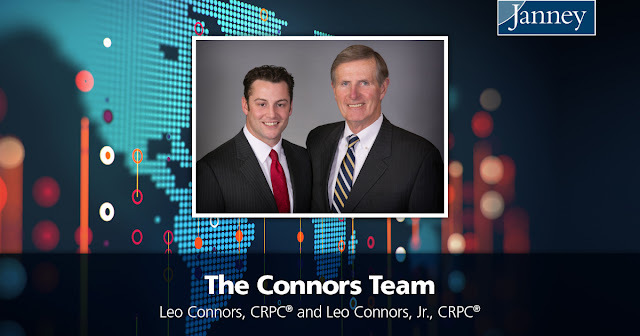 Leo Connors and Leo Connors, Jr. have over 50 years of combined financial services industry experience and each holds the Chartered Retirement Planning CounselorSM (CRPC®) designation. Both are very active in their communities. Leo Connors serves on the board of St. Martin de Porres Academy and was previously the Director and Chairman of the Hospital of Saint Raphael foundation. Leo Connors, Jr. serves as the Chairman of the Sustainability Committee on the Board of New Reach, serves on the board of the Central Connecticut Coast YMCA, is a board member on the Greater New Haven Chamber of Commerce, and was a founding Board Member of the Chamber’s Young Professionals Organization.